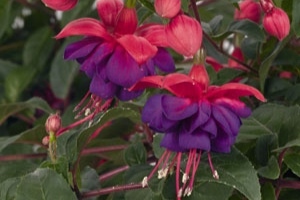 Fuchsia are delicate but very beautiful types of plants. Most bloom from early summer until frost while giving you a shot of color in those shader areas. Whether it be under the deck or porch or on the North and East sides of the house, fuchsia won’t let you down. While they are primarily used in hanging baskets or containers, they can be found in beds and borders as well.